Description: Reporter voice over with black image about the United States new 200 mile fishing limit to restrict foreign and American fishermen. 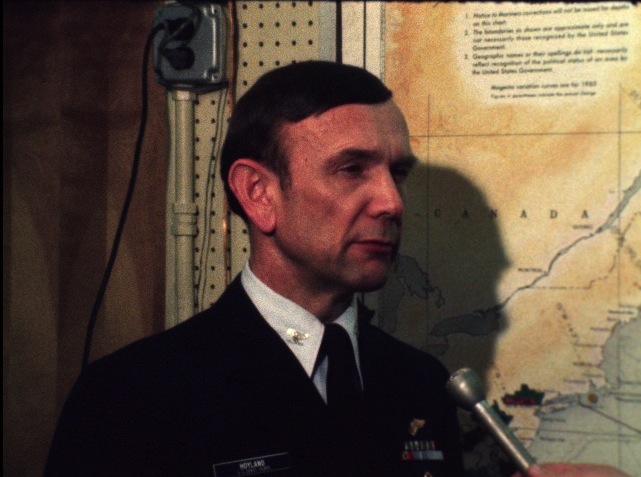 Coast Guard Commandant, Owen W. Siler, speaking at a press conference about the initial success of the law and foreign cooperation. 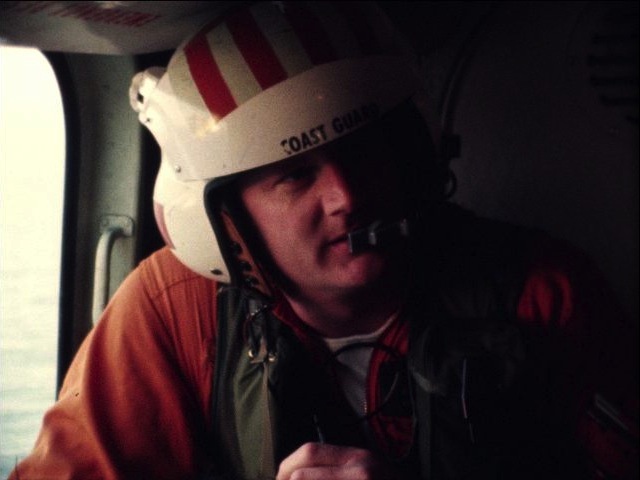 B-roll of the Coast Guard aircraft, aerial view of the ocean, pilots flying, and press conference with the Coast Guard. Closing reporter voice-over with black image. Sound and wild sound. Description: Interview with a Navy officer about a ship that has lost communication and can't be found. Sound. Description: This is footage from the 1972 Boston Marathon. 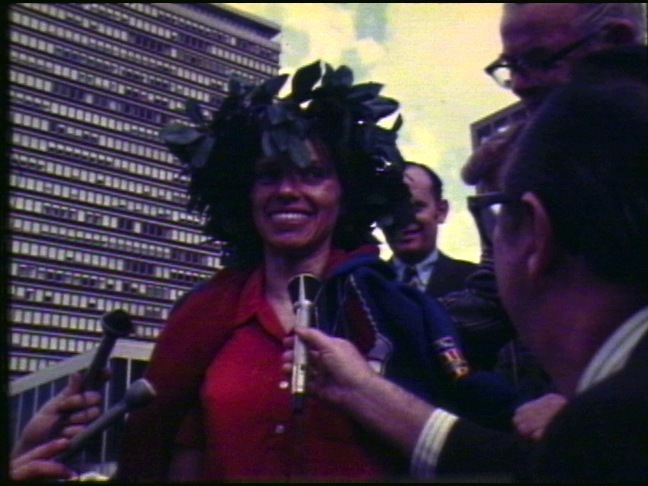 Footage of Nina Kuscsik, the first female finisher, at the finish line. The 1972 marathon was the first year that women were officially allowed to run. Footage of people running the race. Interview with Olavi Suomalainen, the first male finisher, and an interview with Kuscsik at the finish line. More footage of Suomalainen running and at the finish line. This is 1 of 2 reels. Description: Reporter voice over with seemingly unrelated film of people in a public square shot from the window of a building. Chairman Edward Harrington announcing the decision to suspend licenses of certain bars. B-roll footage of the exterior of the bars, followed by silent b-roll footage of the hearing with shots of the audience, board members, and others. Reporter voice over wrap-up of the story with seemingly unrelated footage of the street shot from a window. Mix of sound and silent. Description: Story #2394. Action for Boston Community Development news conference. 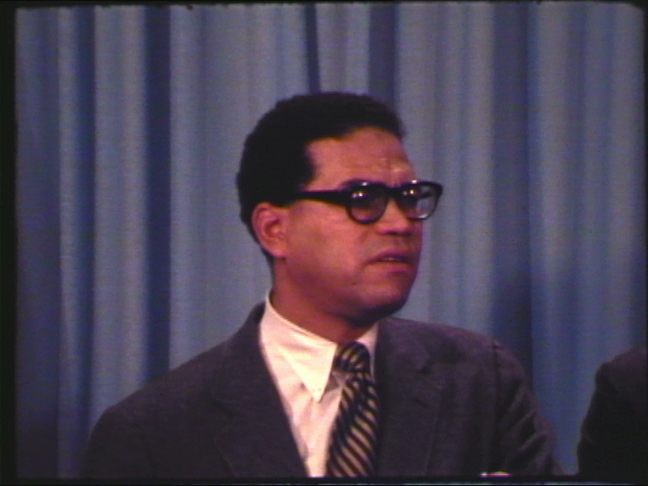 Silent b-roll of people in an office, followed by silent footage of three men at a news conference and the reporters in the audience. Sound footage of speakers discussing ABCD programs including one that involves the release of former convicts back into the community. More silent b-roll of the conference and office, footage of men washing a car, and people in a cafeteria followed by extended footage of some of the speakers. Mix of sound and silence. Description: Bill Baird News Conference with 3 underage girls who want to have an abortion, but can't get parental permission. 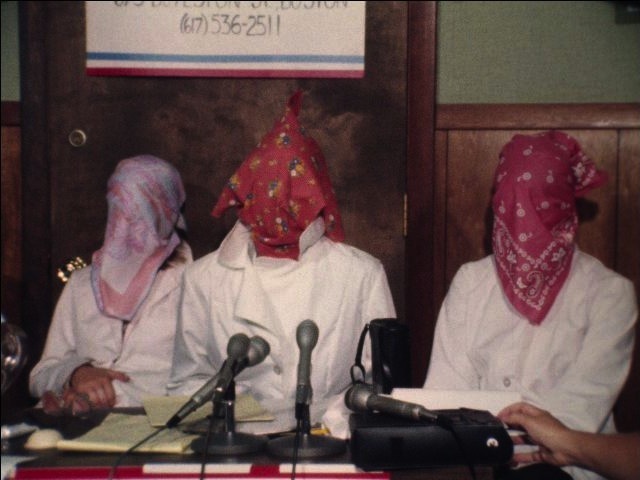 The girls have scarves around their heads to protect their identity. Baird and one of the girls speak about the issue. B-roll footage of the press conference. Mix of sound and silent. 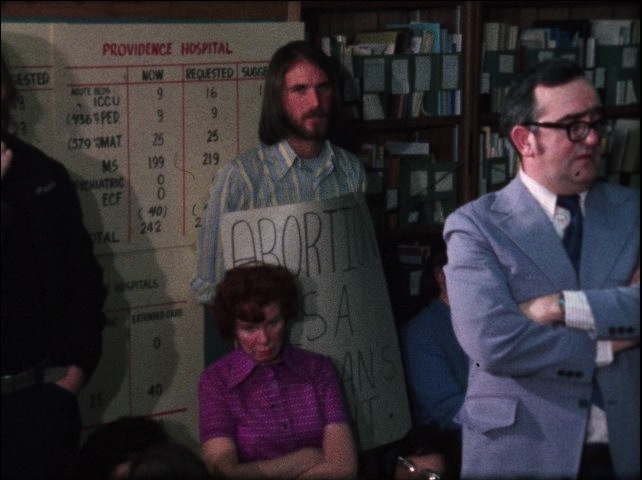 Additional description from the Original WCVB Rundown for this story reads: "Bill Baird produces the 15-year ... who is 11 weeks pregnant and wants an abortion, but her folks say no." Description: Several people led by Bill Baird marching with pro-choice signs. Silent. 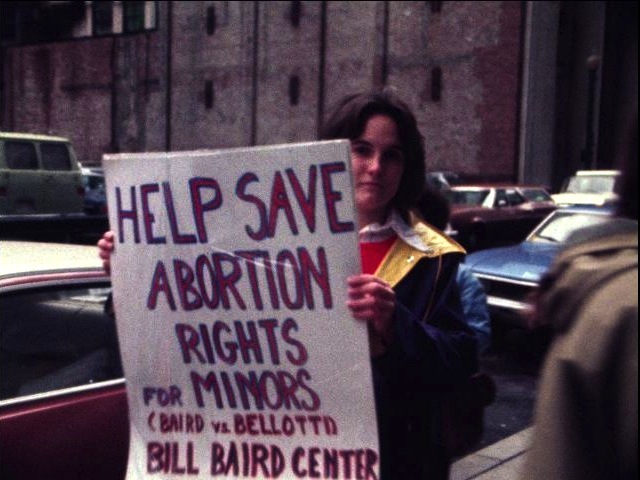 Additional description from the Original WCVB Rundown for this story reads: "Bill Baird Demonstration - Bill Baird challenges a federal law which says that a pregnant teenager who wants an abortion must have written consent of both parents or a court order issued by a superior court judge. This is a mini demo [demonstration] just ahead of the court session." 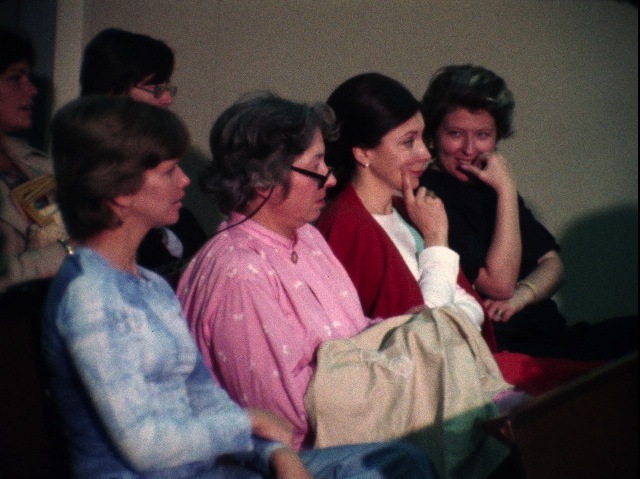 Description: A hearing on the opening of the Crittenton-Hastings House, the first free standing abortion clinic in Massachusetts. Footage includes exterior shots of the building, protesters, and people speaking at the meeting. Mix of sound and silent. Description: Court case between a wife who wants an abortion and her husband, who is trying to stop the abortion. The Massachusetts State Supreme Court ruled in favor of the wife. 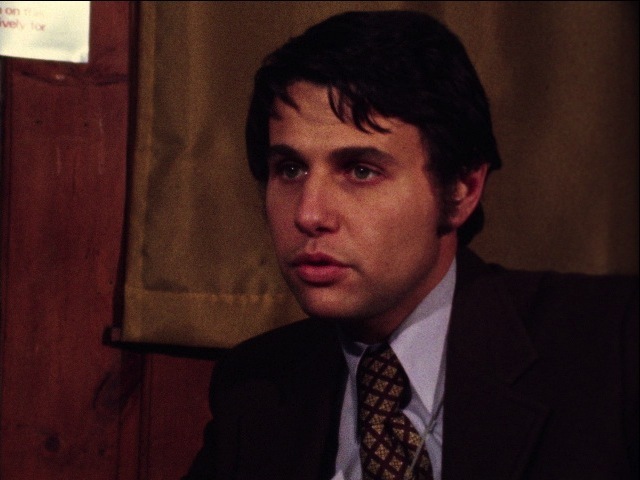 These are interviews with the lawyers representing both side, followed by interview cutaways. Mix of sound and silent. Slug read "Abortion Decision Gold." Description: Man addresses demonstration against abortion. 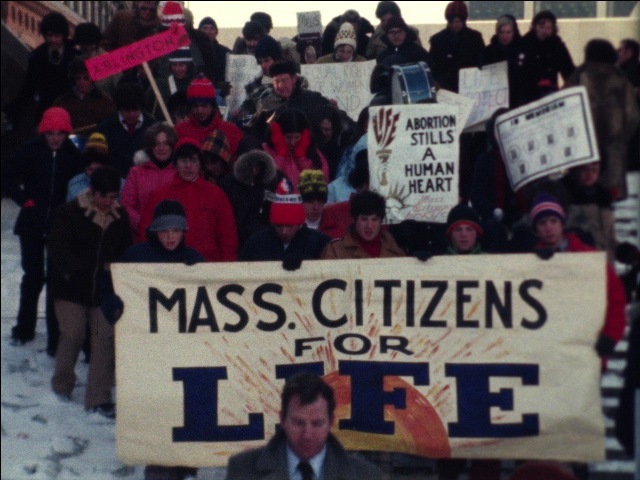 People march holding pro-life signs. A priest addresses the demonstration. Sound.